Just because jalapenos haven’t ripened in these parts yet, and neither have tomatoes (unless you splurge for the hothouse types), doesn’t mean it’s nach-yo season for nachos. Or at least, that’s what the founders of Nachos NY think, year-round. And who am I to argue with that kind of authority? After a successful Guactacular Invitational, for which the site’s founders Lee and Rachel asked me to be one of the judges of ten guacamoles, they suggested we get in the kitchen and make some nachos for ourselves. So I called for a bonafide “nachos party” at a friend’s barbecue, and corralled a bunch of friends to join. And by corralled, I just mean that I merely told them it was happening. It’s one of those things that’s easier done than said. And actually, making “nachos” is one of those things as well. All there is to do is layer a few ingredients on top of a pile of crisp tortilla chips, embed it with shredded cheese, and let it melt — no need to stop the world. There was only one fixin’ that took a while to get ready. Okay, so it took maybe 5 hours. But it was thankfully hands-off cooking; the pork shoulder, begotten from Queens County Farm Museum was left to marinate for three days and slow-roasted for that many hours, before pulling into shreds. Afterward it was given a few squeezes of lime and a good sit in the juices it produced while roasting, which were plentiful. The rest of the makings of this nachos platter were purchased the day of the party, at the Greenmarket: ramps, asparagus, radishes and some smoked cheddar from Millport farms. 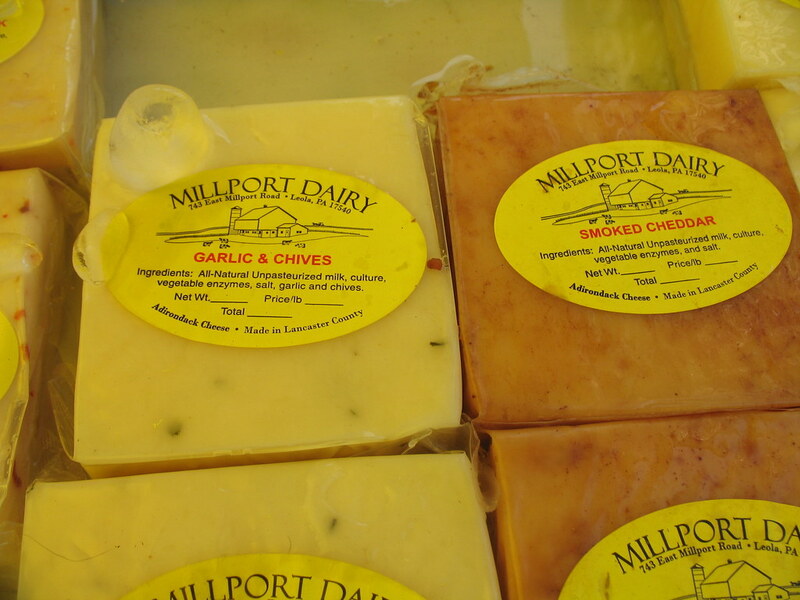 I highly recommend the latter dairy farm (they gave me a “don’t-have-enough-cash” discount when I bought their cheese around 4pm, after having “a pretty good day.” Whoops, but you didn’t hear that from me!) Though they had the classic Tex-Mex topper, pepper jack, among their blocks of cheese, I went for the smoked cheddar for the sake of the spice-shy (the pepper-studded tester I tasted was hot!) and vegetarians — two versions would be made, with and without meat. I’d grabbed the second-t0-last bunch of ramps from Berryknoll Farms, too, much to the dismay of Risotto Challenger Mike O’Neill, who I ran into minutes later. He was shopping for his entry for the next day’s cook-off (which I’ll get in a complete wrap-up shortly! Don’t worry, Mike’s risotto turned out pretty well despite). I was shopping for that evening. 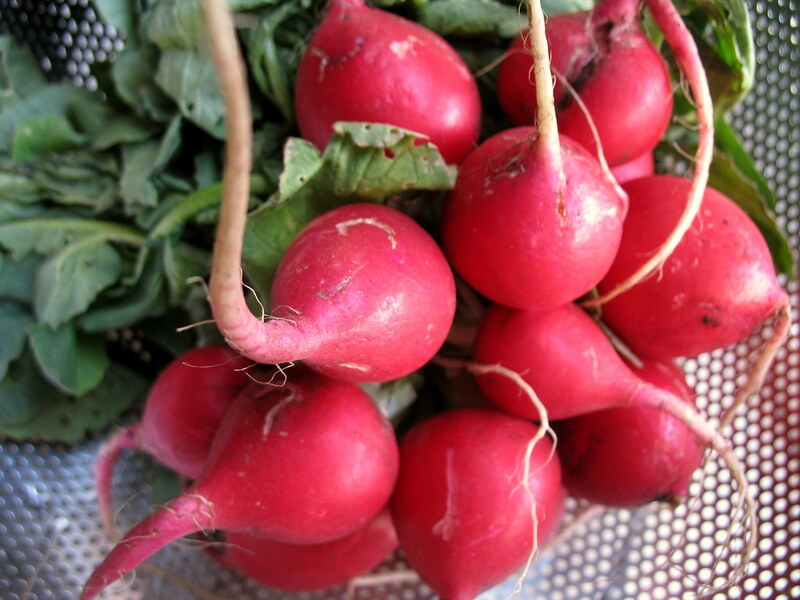 Once home, I finely chopped up the bunch of radishes I’d gotten for a bargain from D&J’s organic farm for $2. I still have the greens to play around with. I mixed this with lots of lime juice, a spray of red pepper flakes, a couple of those ramps, crushed garlic, olive oil, and since I’d had them on hand after an impulse purchase at Fairway one day, some grape tomatoes. This was the makings of the “spicy radish salsa” that topped the finished nachos. The part about these nachos I was most excited about, however — no matter how great the pulled pork or that smoked cheddar was — were the asparagus chunks. I’d never seen fresh asparagus piled into a nachos platter in my life, and after eating so much of it last night, I can’t see why. The bunch I’d gotten that day were so fresh, crisp and sweet, they could be splashed into the arrangement without being cooked beforehand, and lent it a crunchy, vegetal note — worlds better (or just more novel?) than freshly chopped bell peppers, perhaps. You’re listening to a self-confessed asparagus freak, however. In any case, I’d considered grilling those asparagus stalks at the party before chopping and adding them to the platter, pre-melting, but after tasting a piece of it fresh, realized that it needed no such adulteration. What can I say, asparagus is great (and great for you). Those along with the rest of the bunch of ramps sealed the “spring nachos” theme. 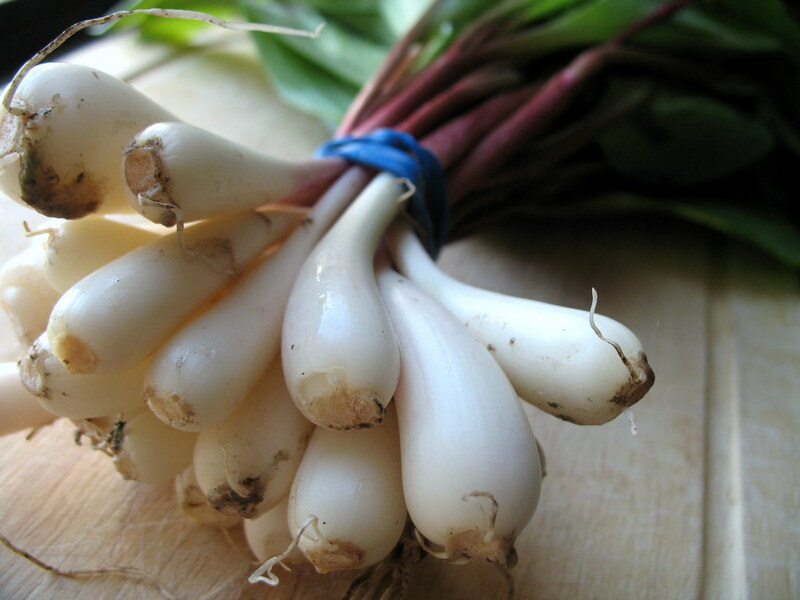 Many people at the party asked what ramps were, figuring the long, scallion-looking bulbs with the billowy, rabbit ear leaves were something similar to other onionlike beings they’d seen, but never in that juxtaposition. They’re ramps, and I have no idea why they’re called such. I have a longstanding inside joke with my friend Matt over our love for the T. Rex song called “Raw Ramp,” and neither of us can figure out why the song’s chorus consists of those words, either. A delicious mystery. I’d asked others to bring the tortilla chips to the party, and once there, I decided to stay outdoors beside the grill, instead of indoors with the oven. 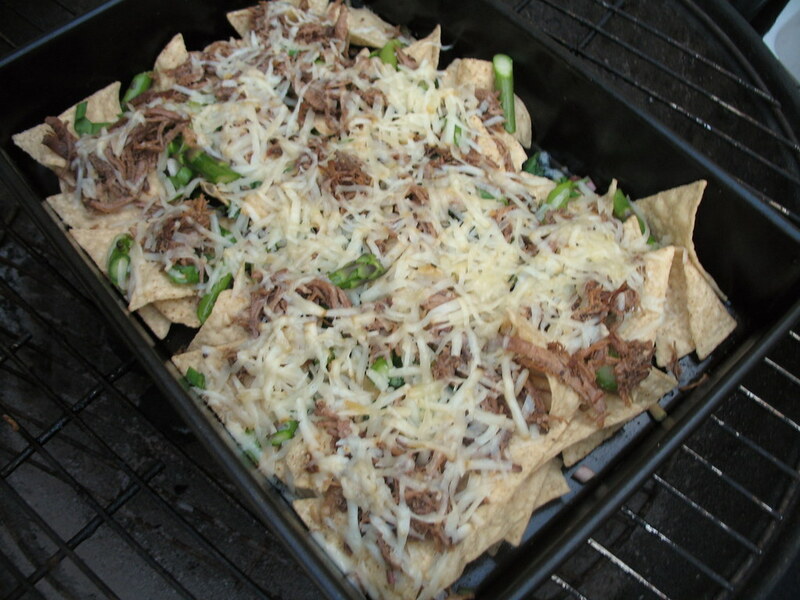 So once the casserole dish of spring nachos was sufficiently piled, I stuck it on the rack above the charcoal and put the lid on. A few minutes later, the cheese had melted into many of the cracks, and it was ready to eat. A sprinkle of the cool radish salsa on top made the platter complete. With all the fixins’ on the table, people grabbed soft tortillas and rolled themselves tacos with the extra pork, asparagus, ramps, cheese and salsa, as did I. A touch of guacamole inside (thanks to the folks from Nachos NY) gave it a to-die-for finish. These guys are pretty serious about what they’re doing: they were sporting t-shirts that said, “‘chos before hoes.” In the meantime, I’ve still got nacho juice on my shirt I wore to the party. I think that says it all sufficiently. 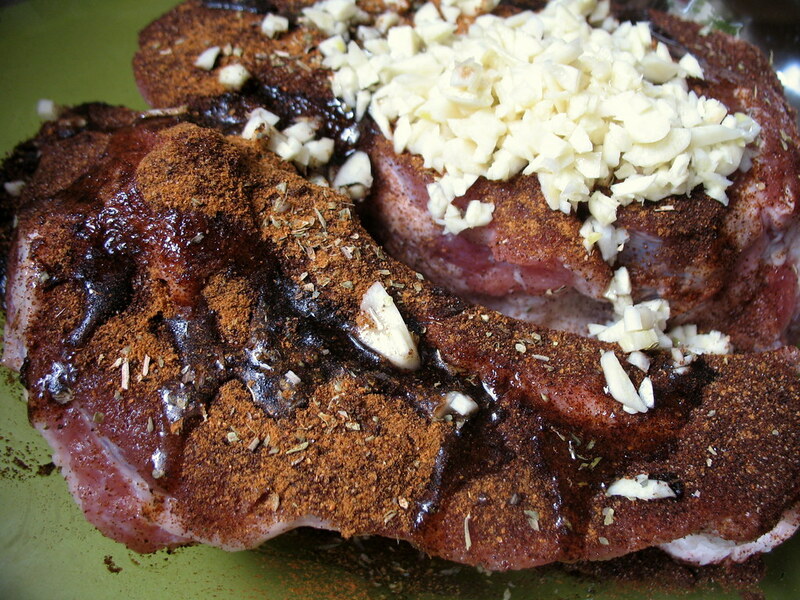 Rub the pork shoulder with the seasonings and let marinate overnight, or up to 4 days. Preheat the oven to 500 degrees. Arrange the pork in a cast-iron or heat-safe baking dish small enough to fit it without too much extra space. 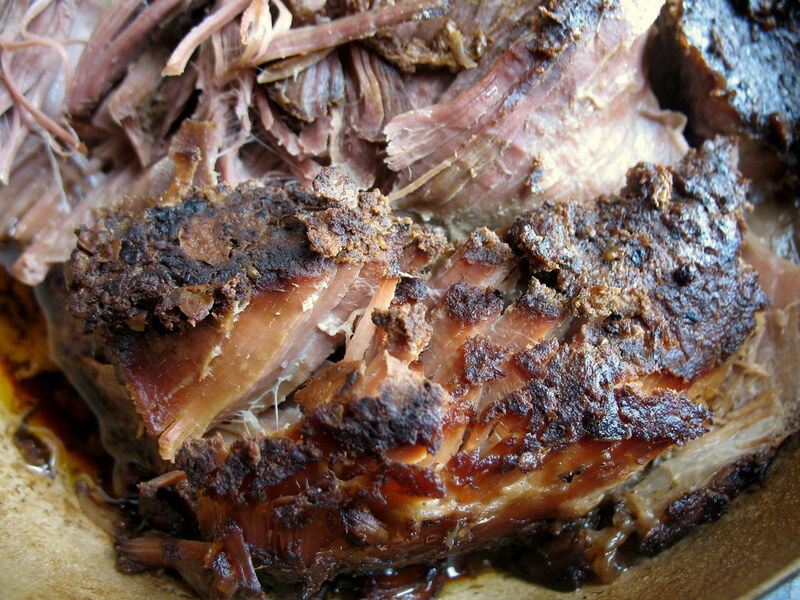 Roast uncovered for 10 minutes; lower heat to 300 degrees, cover and cook at least 3 hours (or up to 5 hours) more. Let cool before removing bones and tearing into shredded pieces. Add a squirt of lime or lemon juice and extra seasonings to taste. Combine all the ingredients for the salsa and let chill at least 30 minutes (or up to overnight) before serving. Working in batches, layer a pile of tortilla chops on the bottom of a casserole dish. Evenly distribute the asparagus, ramps and shredded pork. Top with the cheese. Bake, uncovered, for 10-15 minutes (or else place atop the racks of a grill and cover) or until cheese is melted. Top with the salsa and serve immediately. Seven brownie points: The glitch in this could-be-healthy equation is the fried corn chips, or tortillas. 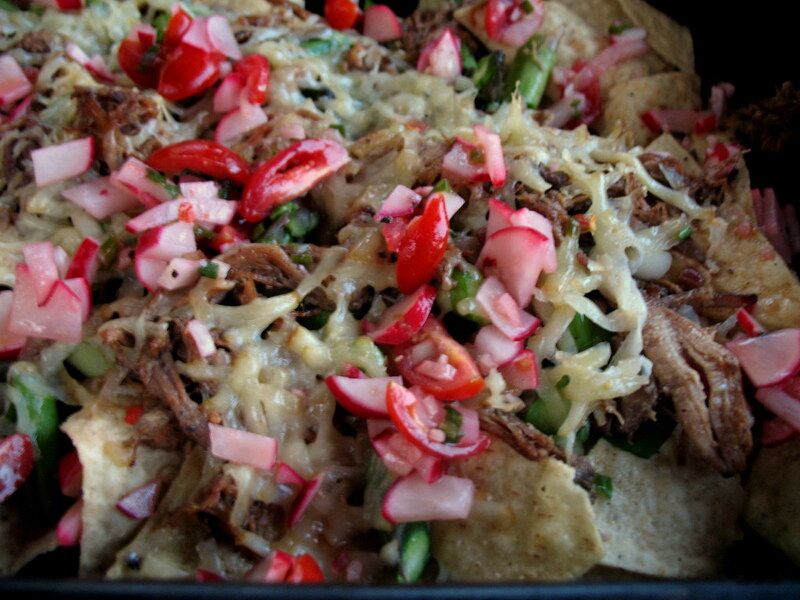 Possibly, nachos could be made with oven-baked corn or flour tortillas until crisp, and then added to the mix. But it wouldn’t quite be the same. Still, this dish is a well-balanced, nutritious meal despite, with fresh veggies like ramp leaves (which add Vitamin K and C to your diet), and a wealth of low-calorie vitamins from the asparagus. The roast pork, as long as you trim most of the fat, is relatively lean, too, so long as you don’t gussy it up with extra oils or dressings. 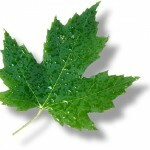 Seven maple leaves: A decent showing in sustainability, for using mostly seasonal and Greenmarket-found meat and produce. The only thing I’m still kicking myself about are the chips themselves; I’d wanted to grab Hot Bread Kitchen‘s wonderful fresh corn tortillas and deep-fry them myself, but didn’t find the chance; I brought all the fixins’ from the market (and my oven) and made everyone else figure out what chips to get instead. Sounds like a great party. Would red cabbage work in the salsa as well? Love that crunch. I’ve never had ramps (and actually I’m wondering if they even grow in Utah as I’ve never even seen them.) But this sounds intriguing! 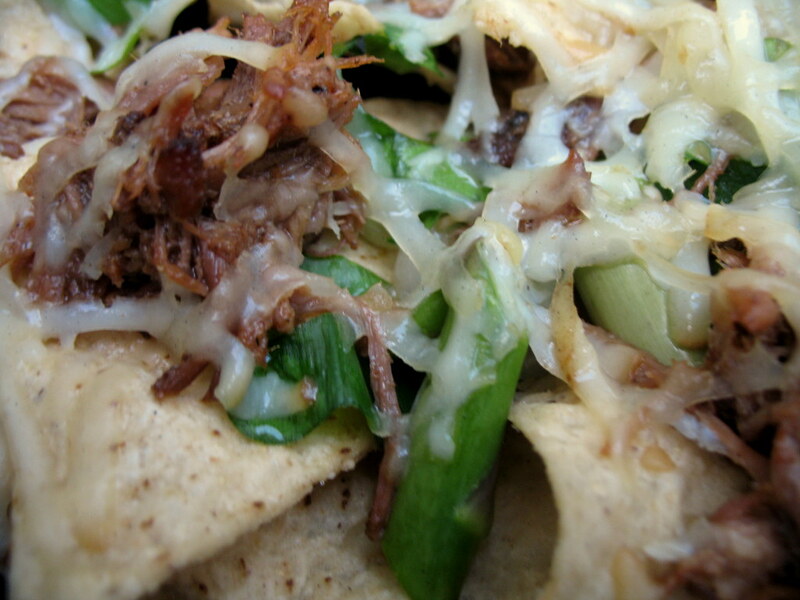 Wow, those really are the perfect spring nachos – so creative and they sound delicious! We had a good time and are about to review our evening in the presence of a mastermind. 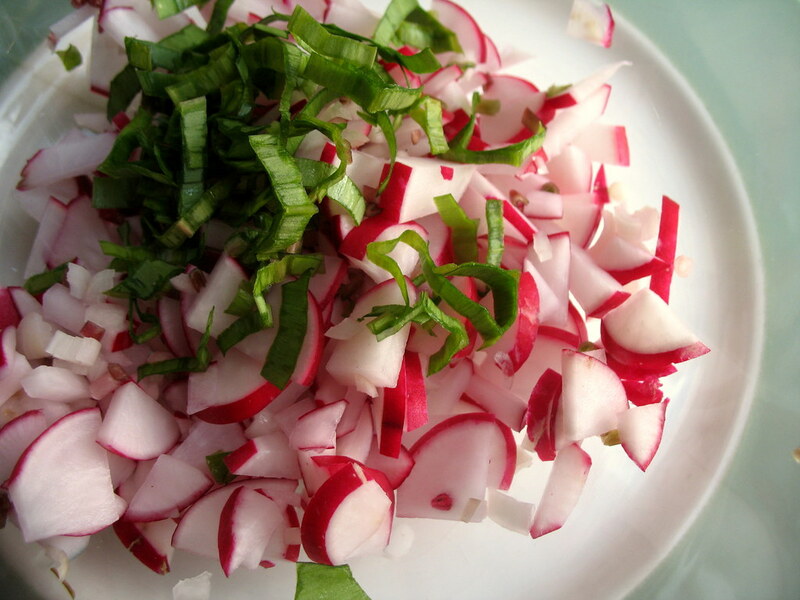 Love the idea of a radish salsa (and Kim’s idea of incorporating red cabbage). Since radishes are available all year around, I can see substituting apples for tomatoes in the fall and watermelon in the spring. Exciting experiments await!